EzineArticles Asks: What Are You Reading? Expert Author articles, books by famous authors, books by not-so-famous authors, news articles by ground-breaking journalists, posts by leading bloggers, and more – read everything and anything you can get your hands on. Thumb through celebrated periodicals and even divulge in a little guilty pleasure by browsing through those tabloids waiting at most checkouts – whatever you do read, absorb it and reflect on what you read. These reflections will help you understand an author’s approach as well as the nuances and tricks of writing a convincing story that engages readers. And you need engaged readers who are compelled by your writing. A compelled reader will want more of what you offer by continuing from your article and on to your website because you’ve resonated with their needs and interests by striking a chord with them. Without an engaged audience, you’ll be a one-man band playing out-of tune to an empty room. Read to be engaged and engage others! Reading is absolutely essential for Expert Authors. Think of it like this: You can’t (or shouldn’t in most cases) be a lawyer without studying and understanding the law. You can’t be a scientist without absorbing and learning the science. You can’t be a postmodern artist without understanding the works of leading postmodern artists. And so on. Reading is an incredible tool for Expert Authors – make time to use it! Read for discovery. Reading is not so you can say this at cocktail parties: “Yes, I read War and Peace cover-to-cover” (with the underlying subtext “be impressed by my reading prowess and canonical-guided magnificence”). Good readers don’t read to reach the ending. They read to connect with and understand new ideas and old traditions. If someone asked them what they thought about War and Peace, connected readers (and authors) would likely focus on the how the pieces of the work fit together and the emotion, not just the play-by-play plot. Read for growth. Avoid limiting yourself to one particular genre and soak up a variety of subjects, style, language, ideas, and inspiration by reading a wide-breadth of content. If you haven’t already, make time for reading every day. Not only will you increase your knowledge and vocabulary, reading can be entertaining, provide mental stimulation to keep your brain active, improve your memory, and overall boost focus. Set a specific goal (in this case, reading every day). Start with an easy target (such as reading for 15 minutes, 1,000 words, or perhaps 5 pages). Create a cue so reading becomes an automatic response (such as when you get home from work, wake up, finish dinner, etc. then you’ll read). You will eventually notice your reading target increasing and may begin craving to read! What’s the credibility of the author and/or the publisher? Who is the audience the author is writing for? What is the author stating? Is the author making any assumptions? What was the context of the author’s position? Did the author imply anything? What’s the author’s purpose or motive in writing this piece? What tone or attitude does the author adopt? Does the author use formal or informal language? Is the author writing objectively or emotionally? What conclusions did the author reach? How does the author’s position compare to others in their niche? Did the author say anything new? What part of the article pulled you in? Note your reflections in a reading journal or simply give yourself a few moments to ponder. Either way, you can use these questions to give your reading a contemplative punch as well as inspiration for your own articles! What are your thoughts? Are you passionate about reading? What are you reading to expand your expertise? What are you reading for pleasure? How often do you read and how long are your reading sessions? Do you have any great reading recommendations for fellow Expert Authors? Do you think Stephen King’s view on authors who don’t read is too harsh? Let us know! Share your comments or questions below – we’d love to hear from you. I agree with Stephan King. Books are good silent friends and now a days most books are available for free, others cost few bucks but they provide useful insights and valuable information. I agree with you, I love to read but I don’t sustain it for long time and it takes me longer time to finish a book, I read to improve myself, get inpiration, knowledge and exposure. I love to write too, though not very perfect at it, and I want to really improve on ready and writing skill. Thanks to EzineArticles, anytime they start publishing my article then I will know I have really improved. Yes! But, unless you can’t see to read, not alone. An audio book is affected by the speaker as much as by the author, and good and bad diction, intonation and the sheer power (or lack of it) put into the reading by the speaker can lift or kill a poor book and enhance or depress a good one. It’s harder with an audio book to answer the 15 questions above. I have a blind West Indian friend in her 80s who waxes strong about the relative merits of the speaker, rather then the book. And that’s why you should read books for yourself, if possible, rather than have someone read them to you. Put another way, when you’ve read a book and seen the movie, is it the power of the author’s vision that attracts you – or the power of a favourite actor’s interpretation? And when the movie came first, how often is the ‘book of the movie’ a good one rather than something rather flat? Not very often, I think! No. This post emphasise the habit of reading and not listening. Absolutely agree and yes audio books do count as far as I am concerned. Be a sponge but wring out often! There is no point just absorbing what you read, you need to pass it on, put your own spin on it and add you own experiences. Once you really start reading you’ll rediscover your ‘new ideas’ gene and you won”t be the same again! I love your 15 reflection questions too! Audio books should be counted because they share the same information but reading has its own enjoyment. It’s important to read a lot of short articles, too, on anything that calls to me, but especially my specialities. Many of these are in blogs and newspapers (the BBC News online has great short summaries of hot stories – and links for followup), though I’ve dropped news feeds because they tend to be overwhelming and can quickly go off topic. I can then learn the good and bad of article writing, as well as using this site. The last point is that discipline is required. I personally need to watch: spending too long on fiction, especially if it grabs me; following a good topic too far – ie, beyond what I need for my own writing; and spending too long developing an article: if it gets long, I’ll split it and concentrate on one first. I remember a few years ago finding an old Readers’ Digest article in one of my niches and trying to update and correct its points. I had to take myself in hand when I hit 2000 words! In the end, I got 7 great articles based on the one 6-page digest! This article focuses on books as the target for reading, but that’s not the whole story. My niche is very technical and I spend a great deal of time reading open forums dedicated to it. I get a number of my article concepts from this practice. Reading any book or newspaper, electronic or paper form, irrespective of language, author and time will definitely impact our thoughts and actions. Reading newspaper in the morning helps us to update our knowledge on the latest happenings in the world. I prefer reading eBooks while travel . Great contents. I love to read. I personally believe reading is the best form of human activity that I have discovered. I thoroughly enjoyed this article on reading more, and I totally agree with all the points made. I have been an avid reader myself right from childhood, and I think there is no greater pleasure in life than curling up on the sofa with a real good book. In my childhood, the authors who gave me most pleasure were people like Enid Blyton, C.S. Lewis and P.L. Travers (who wrote the Mary Poppins books). As I got older, I started to read the Jennings books by Anthony Buckeridge, along with the Just Williams series and the Willard Price adventure novels. Now, in my adult years, I love reading James Herbert, Stephen King (whose views on the importance of reading, by the way, I wholeheartedly endorse) and Graham Masteron. I also enjoy reading autobiographies. I think it is very sad, though, that a lot of young people are leaving school now illiterate. If only more of them would take more interest in reading. I don’t know how anybody can say that they are “not interested in reading books”, as they just don’t seem to appreciate the great value and pleasure one can derive from the written word. Now that I have become a published writer myself, I am pleased to say that I owe much thanks to my voracious reading habits, and assimilating everything I possibly can from different authors. Reading everything you possibly can not only strengthens your own writing capabilities, but it also educates you on different things, giving you a broad view of the world. Learning different genres is just endlessly fascinating. And the more you read and absorb, the more knowledgeable you become. So, yes, read, read, and read again. Certainly the best advise anybody could give to a writer. Stephen King does make a valid point. Writing is a type of art. Artist’s are constantly looking at other peoples art, and analyzing different techniques to achieve different effects. As an author, it’s up to you to analyze different techniques others are using to relay their message. By analyzing and noticing what’s effective, you will greatly improve your own writing. I’m currently reading The Hunger Games for fiction, Adsense Secrets 5 for work, Convict Conditioning for health, and How to Write a Killer Thriller to further my writing. 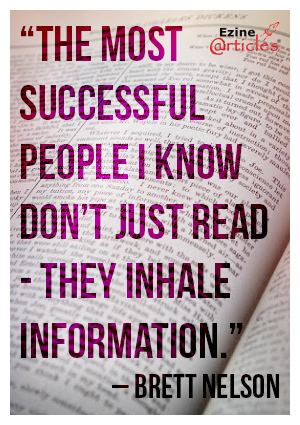 “Don’t just read it…Inhale the information”! Great Post, Reading can increase your confidence, you are providing best content to analyze, research and ideas for the content marketing. i love to read technology blogs and I’m currently reading “Who will cry when you Die” by Robin Sharma, Great book with Awesome Thoughts. As a retired secondary school teacher, I have memories of youth reading habits going back well over half a century. I can assure you, Alan, that kids haven’t changed at all in that time! Reading is the most advanced mental skill that people generally use today. (People can avoid complex maths and mental arithmetic easily and are usually happy to write at a lower level of complexity of thought and grammar than they are required to read.) Because of that, at least half of all readers have always been uncomfortable with extended reading unless they have a serious motivation. Newspapers recognize this: the reading age of all but the most erudite papers is restricted to first school level, plus specialist vocabulary (such as football or popular medical terminology). So you need to be careful in allocating the term ‘illiterate’ to the majority of people in parts of the world where all but a few percent of the population can pick up a newspaper and work out what any article says. For most of the world’s population, that’s impossible! All that you say in your last paragraph is absolutely true, but do remember that to most readers, reading for information is hard work; you and I, though, can read almost anything in our native language and comprehend with ease. That’s why we are advised to pitch our articles to our target readership and to keep thing short, snappy and interesting if we want them to get beyond the first paragraph before clicking away!